VINCI Construction JV has been awarded the contract to construct a new junction on the M20 near Ashford in Kent. The project has been awarded as part of Highways England’s Collaborative Delivery Framework, which Taylor Woodrow sits on in joint venture with VINCI Construction Grands Projets. The team will be building junction 10a 700m east of the existing junction 10 near Ashford. 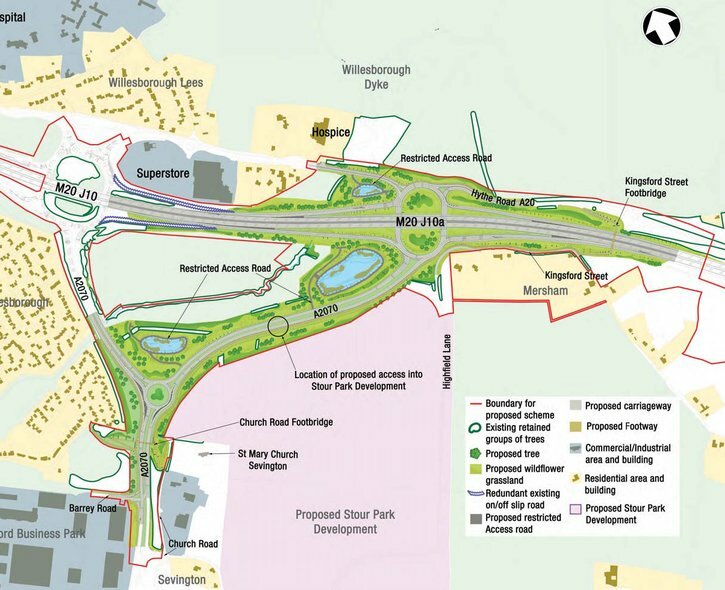 The proposed layout is pictured and once complete, the junction will use two bridges and connect to the existing A20 and a new dual carriageway link road built to the A2070 near Sevington. The junction will help reduce congestion at the existing junction 10 and facilitate future growth in the area.